56-year-old woman with decreased vision for the past year. She was referred from comprehensive clinic with cataract and endothelial guttae. She was told she had Fuchs’ dystrophy 14 years prior to presentation. Over the last year, her vision had been declining progressively. She described poor vision in the first 2 hours of the morning as well as increasing glare and difficulty driving. She denied eye pain and foreign body sensation. A full review of systems was negative except as noted in the history of present illness. Equally reactive in each eye from 4mm in dark to 2mm in light. No relative afferent pupillary defect. Optic nerve: 0.3 cup-to-disc ratio, no pallor or edema. Pentacam Scheimpflug imaging was obtained and is shown in Figure 1. There is an increase in densitometry at the level of the cornea in the right eye, indicating mild light scatter or opacity from corneal edema. Corneal densitometry in the left eye is normal. The corneal thickness map also shows increased central thickness in both eyes. Figure 1. Pentacam anterior segment tomography, OD and OS. 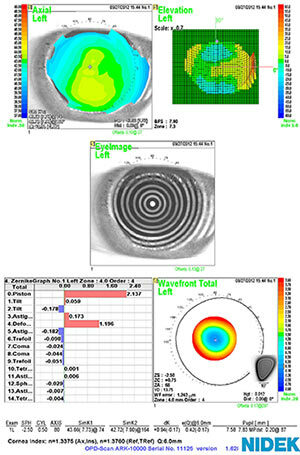 NIDEK corneal topography was obtained and is shown in Figure 2. There is low regular with-the-rule astigmatism and mild irregular astigmatism in both eyes, which are not contributing to the patient’s visual dysfunction. Figure 2. 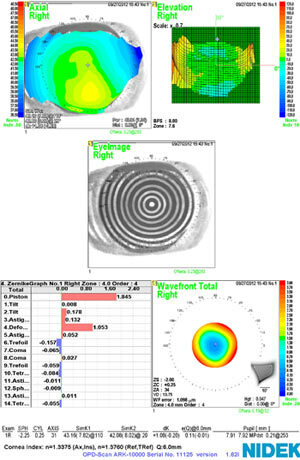 Corneal topography, OD and OS. Confocal microscopy of the corneal endothelium of both eyes revealed decreased cell density with abnormal cell morphology (Figure 3). Figure 3. Confocal microscopy of the corneal endothelium, OD and OS. The patient’s symptoms and examination were consistent with the expected findings of endothelial dysfunction secondary to Fuchs’ endothelial dystrophy. She also had early nuclear sclerosis in each eye. For a discussion of symptoms and clinical findings of Fuchs’ endothelial dystrophy, please see http://eyerounds.org/cases/case5.htm. Treatment options including medical therapy and surgical intervention were discussed with the patient, including the likelihood that her cataracts would progress quickly with corneal surgery alone. She elected to undergo staged surgery, with cataract removal and intraocular lens implantation in the capsular bag followed by Descemet’s membrane endothelial keratoplasty (DMEK) 2 weeks later, beginning with the right eye. The surgical technique used for this patient is outlined below in Table 1 and demonstrated in Video 1. At post-operative week 2, uncorrected visual acuity was 20/40, with pinhole acuity of 20/25 +1. The DMEK graft was well attached without edge lifts, and with clear and compact recipient stroma. 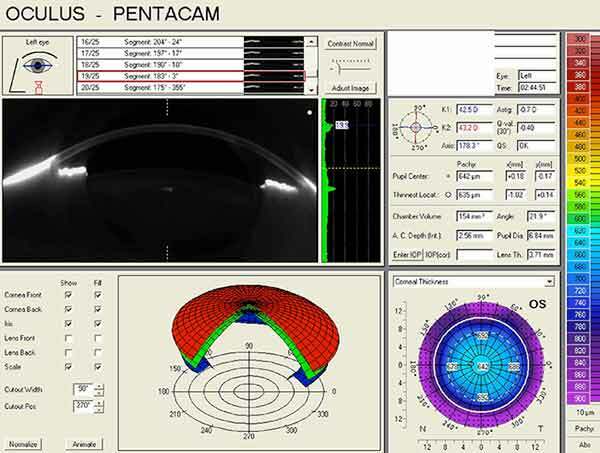 Anterior segment OCT was obtained to assess graft adherence and detect any edge lifts that need close monitoring. The scans confirm graft adherence without edge lifts and demonstrate resolution of stromal edema and Descemet’s folds between post-operative day 1 and post-operative week 2. Figure 4. Anterior segment OCT OD, (A) post-operative day 1 and (B) post-operative week 2. At post-operative week 4, uncorrected visual acuity was 20/30 -2, best-corrected visual acuity was 20/20 with a manifest refraction of -1.25 D sphere, and the DMEK graft remained well attached with clear recipient corneal tissue. Surgical options for Fuchs’ dystrophy include a variety of techniques that have evolved over time. Full thickness corneal transplantation, or penetrating keratoplasty (PKP), was the standard of care until the turn of this century when partial thickness transplant techniques were developed. Partial thickness techniques diminished postoperative complications of wound dehiscence and high astigmatism associated with PKP. Melles first described a technique for posterior lamellar keratoplasty in 1998. This was modified and popularized in the United States as deep lamellar endothelial keratoplasty (DLEK), described in 2001 by Terry and Ousley. In this procedure, a deep corneal dissection plane is created and approximately 150 microns of posterior stromal tissue is resected from the recipient cornea. A manual dissection of posterior donor tissue is performed, and the donor lenticule is positioned into the recipient bed. DLEK became a good choice for patients with endothelial and posterior stromal pathology. However, several conditions limited widespread adoption of DLEK, including a high degree of technical difficulty, significant risk of tissue loss in donor graft preparation, and variably smooth donor-host interface that limited visual recovery. Melles developed an alternative technique in 2004 to simplify and improve on the early endothelial keratoplasty (EK) techniques. Called Descemet’s stripping endothelial keratoplasty (DSEK), this procedure involves manually stripping or peeling away the host endothelium and Descemet’s membrane, leaving the posterior stroma of the host cornea intact. The implanted donor graft includes endothelium, Descemet’s membrane, and a thin layer of posterior stroma. In the DSEK technique originally described by Melles et al. in 2004, the surgeon manually dissects the donor tissue using an artificial anterior chamber. However, modifications were introduced that further simplified the technique, including the use of a microkeratome for graft preparation to reduce the risk of tissue wastage, and the use of a viscoelastic device to maintain the anterior chamber during host corneal preparation. When the donor tissue is dissected with a microkeratome or femtosecond laser, the technique is referred to as Descemet’s stripping automated endothelial keratoplasty (DSAEK). Most eye banks now provide pre-cut tissue and thus can eliminate the risk of tissue wastage for surgeons; this condition, along with crucial technique modifications, has allowed DSAEK to become the most commonly performed keratoplasty procedure performed today. Corneal Endothelial Transplantation: Descemet's Stripping Endothelial Keratoplasty (DSEK). Available from: http://www.EyeRounds.org/cases/54-Descemets-Stripping-Endothelial-Keratoplasty-DSEK.htm. While DSEK and DSAEK are excellent and reliable surgical techniques, light scatter from the graft-host stromal interface may degrade image quality and limit final visual acuity. Therefore, methods to transplant only Descemet’s membrane and endothelium are now at the forefront of endothelial keratoplasty. Methods to decrease DSAEK graft thickness are also under development with proponents claiming to achieve faster visual rehabilitation and better visual outcomes. Data from these techniques are forthcoming. McCauley, Price and Price described a modification of DMEK that combines elements of the DMEK and DSAEK techniques (2009). This was coined DMAEK, or Descemet’s membrane automated endothelial keratoplasty. The goal was to obtain the excellent visual outcomes of DMEK while making the procedure technically easier. Instead of transplanting bare donor Descemet’s membrane and endothelium, a rim of stroma is left at the periphery of the donor lenticule. Having a rim of stroma surrounding the central thin area of Descemet’s membrane may allow increased tissue stability with easier unfolding and positioning of the donor graft. Studeny described a similar technique in 2010 called DMEK-S (Descemet’s membrane endothelial keratoplasty with a stromal rim). The difference between DMEK-S and DMAEK parallels the difference between DSEK and DSAEK. In DMEK-S, the donor tissue was prepared manually while in DMAEK, the initial posterior lamellar dissection is done with a microkeratome or femtosecond laser. Our patient elected to undergo DMEK, and the remainder of this discussion will focus on this procedure. DMEK is a treatment option for many of the same patients and conditions featuring corneal edema for which a surgeon would consider DSEK/DSAEK (Table 3). At this time, poor candidates include patients who are at high risk for donor failure or dislocation. A glaucoma seton tube or anterior chamber intraocular lens can interfere with positioning of the graft, and contact with these intraocular devices will damage the donor endothelial cells, increasing the risk of these complications. In addition, glaucoma procedures of any type make it difficult to maintain the gas bubble and intraocular pressure needed for graft adherence, and prior core vitrectomy may make it difficult to achieve the shallow chamber needed to unscroll the graft using our technique. A review of the first 50 patients who underwent DMEK with the Melles group found that the procedure offered quick visual recovery with excellent final visual acuity (Ham 2009). Early graft detachment was the main complication, and DSEK was performed as a secondary procedure in 10 of those patients. Of the 40 remaining DMEK eyes, 95% had BCVA of 20/40 or better and 75% with 20/25 or better at 6 months. The Price group had similar results in their initial series, finding 63% with vision 20/25 or better and 26% with 20/20 or better vision at 3 months (2009). These early clinical results have been confirmed in more recent series. In Guerra’s retrospective series of patients who underwent DSAEK in one eye and DMEK in the fellow eye, the average best corrected visual acuity (BCVA) for DMEK was 20/24 compared to 20/32 for DSAEK at 12 months. Eighty-five per cent of patients reported a better quality of vision in the DMEK eye (2011). Guerra et al. also reported 1-year outcomes of a prospective series of 136 eyes that underwent DMEK. In this series, mean BCVA was 20/24 with 98% of eyes 20/30 or better, 80% 20/25 or better, and 41% 20/20 or better. Price and Price attribute the better visual acuity outcomes after DMEK compared to DSAEK to the better optical quality of the thinner graft and a decreased tendency of the thinner graft to fold and wrinkle (2010). Endothelial cell loss with DMEK appears to be comparable to DSAEK based on early follow-up data. The Melles, Price, and Kruse groups have reported their post-operative endothelial cell density results. In these studies, the mean donor endothelial cell density ranged from 2560 cells/mm2 to 3010 cells/mm2. Price et al, in a 60 case series, found a 30% endothelial cell decline at 3 months post-operatively and a 32% decline at 6 months (2009). In a report of 1-year prospective outcomes in 136 patients, the same group found similar results with a 31% loss of endothelial cell density at 3 months and a 36% loss at 1 year (Guerra 2011). Studies by the Melles group reported mean endothelial cell density ranging from 1674 cells/mm2 to 1815 cells/mm2 at 6 months post-operatively (Ham 2009, Dirisamer 2011, Van Dijk 2013). Six-month endothelial cell loss was similar for the series of first 50 cases (30%) and their next 200 cases after an initial learning curve (34%) (Ham 2009, Dirisamer 2011). The surgical learning curve does not appear to affect post-operative endothelial cell density significantly. In 2012, Tourtas et al. compared results of DMEK versus DSAEK. They reported a mean endothelial cell density of 1520 cells/mm2 6 months after DMEK. This was similar to the mean endothelial cell density of 1532 cells/mm2 6 months after DSAEK. In a retrospective review of patients who had undergone DSAEK in one eye and DMEK in the fellow eye, endothelial cell loss at 1 year was found to be 31% in DMEK eyes and 34% in DSAEK eyes (Guerra 2011). The curve of endothelial cell loss was similar between the two procedures with the majority of the cell loss incurred within the first 6 months followed by relative stability between 6 months and 1 year. Early reports of combined cataract surgery and DMEK suggest that the cataract procedure is not detrimental to post-operative endothelial cell density. In patients that underwent a triple procedure with phacoemulsification, intraocular lens implantation, and DMEK, Laaser et al. reported an average post-operative endothelial cell density of 1539 cells/mm2 at 3 months and 1550 cells/mm2 at 6 months (2012). 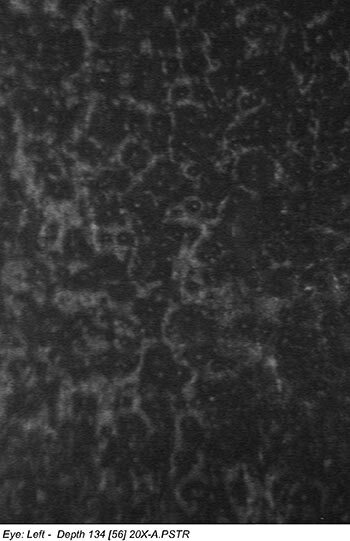 This is similar to the endothelial cell densities at 3 months (1498 cells/mm2) and 6 months (1520 cells/mm2) reported by this group for DMEK alone (Tourtas 2012). Similar to DSAEK, graft detachment is the most common complication of DMEK. Graft detachment after DMEK tends to start with lifting of the graft edges. These edge lifts can progress to complete graft dislocation. Initial reports of graft dislocations requiring a rebubble or regraft procedure were high. In Price’s first series of 60 cases, only 1 graft detached completely, but 38 cases (63%) required air reinjection for partial detachment (2009). As surgeons gain experience, fewer patients require repeat procedures. Dapena et al. published an initial series of 135 cases, reporting a rebubble rate of 20% in the first 45 cases that decreased to 4.4% in the last 35 cases (2011). The Melles group, in their first 50 cases, reported that 10 of 50 cases required a secondary DSEK procedure because of complete or partial DMEK detachment (Ham 2009). Of the 200 cases reported after a learning curve of 25 cases, this complication rate decreased notably (Dirisamer 2011). Overall, 18 of 200 (9%) of patients in that series had a graft detachment that required a secondary surgical intervention by rebubble or regraft; 13 of these occurred within the first 100 cases and only 5 during the second 100 cases, demonstrating further decrease in the rate of this complication with surgical experience. Other complications include primary graft failure due to surgical trauma, damage to donor tissue during preparation, and glaucoma. Damage to donor tissue during preparation is a concern because the thinner DMEK graft tears far more easily than a DSAEK graft. Pupillary block glaucoma has a low rate, despite longer air fill with DMEK compared to DSEK (Price and Price 2010), but remains concerning because of the potentially blinding consequence of this complication. DMEK offers excellent visual outcomes, but donor preparation and graft adherence are more challenging than with DSAEK. Typically, DMEK grafts have been surgeon-prepared. One chief concern limiting the adoption of this surgical technique has been tissue wastage by the surgeon preparing the graft. There have been calls to move the graft preparation process out of surgeons’ hands and into the eye bank to minimize tissue wastage (Terry 2012). Pre-stripped tissue is being prepared by only four eye banks at this time, including the Iowa Lions Eye Bank. Using pre-stripped tissue can minimize contact with the endothelium to one touch. A second concern has been iatrogenic graft damage secondary to tissue injection methods. Currently, there is no specific DMEK injector available for use in the United States. Some injection systems utilize modified intraocular lens injectors, including the Staar microinjector (Staar Surgical Company, Monrovia, CA), Viscoject (Bausch & Lomb, Aliso Viejo, CA), and Zeiss inserters (Zeiss Meditec, Dublin, CA). The Staar microinjector is an open system instrument and requires a viscoelastic agent to help inject the tissue, risking the introduction of viscoelastic into the anterior chamber during tissue injection. However, Price has found improved rebubble rates using a closed injector system without viscoelastic (Feng 2013). European techniques utilize glass injectors. Glass offers a smoother surface than plastic and appears to cause less trauma to tissue. Our technique utilizes the off-label use of a Jones tube (DMEK Jones tube, Gunther Weiss Scientific, Portland, OR; serial #80000-DMEK). The tissue is loaded with ease into the tube via aspiration. The technique also allows slow, controlled delivery of tissue with optimal anterior chamber maintenance. A third concern has been graft dislocation arising from edge lifts. When this occurs early, the patient can position to allow the air bubble to tamponade the lifted graft edge. To prevent edge lift progression as the bubble dissipates, our technique utilizes sulfur hexafluoride (SF6) 20% to increase the half-life of the bubble and achieve a longer tamponade of the graft. Using SF6 20%, we have no cases requiring a rebubble in the first 35 consecutive cases performed at the University of Iowa. A similar observation has been made at other centers. We expect this technique modification will help to decrease the rebubble rate and alter the learning curve for beginning DMEK surgeons. We plan to monitor for toxicity, which has not yet been observed at our center with DMEK surgery. Cataract surgery is commonly combined with DSAEK surgery. Similarly, DMEK can be performed with or without concurrent cataract surgery. Whether alone or combined, a small pupil is required during the DMEK portion of the procedure to protect against graft-IOL contact. When DMEK is performed in combination with cataract surgery, the pupil size must be managed carefully. The pupil should be dilated prior to the cataract portion of the procedure with short-acting agents such as phenylephrine 2.5% or shugarcaine; cycloplegics and long-acting mydriatics should be avoided. Iris expansion devices, which can be removed after the cataract procedure, are another option. Pupillary constriction prior to graft insertion and positioning can be achieved with acetylcholine. The pupil is again dilated after the graft is in place to decrease the risk of pupillary block. When DMEK is performed alone or following cataract surgery, it can be performed under topical anesthesia or retrobulbar block with monitored anesthesia care. Although retrobulbar injection results in pupillary dilation, pupillary constriction can be achieved intraoperatively with acetylcholine. The pupil is again dilated after the graft is in place to decrease the risk of pupillary block. When DSAEK and cataract surgery are performed together, the choice is often made to leave the patient myopic by -1.00 to -1.25D. This adjustment is made to correct for the known hyperopic shift after DSAEK of approximately +1.00D (range of +0.80D to +1.50D). The hyperopic shift with DSAEK has been attributed to the shape of the donor tissue. A lenticule prepared by a microkeratome is thicker at the edges than in the center, resulting in a minus lens effect. With DMEK, since no additional stromal tissue is added, no hyperopic shift was predicted. However, Ham et al. found a smaller but statistically significant hyperopic shift with DMEK as well (2011). In 50 eyes that underwent DMEK, the mean increase in spherical equivalent was +0.30D. They also found an increase in posterior curvature along with the expected decrease in pachymetry. These findings suggested that instead of graft shape, the shift in corneal power with DMEK is secondary to decreased swelling in the posterior stroma with an associated steepening of the posterior corneal curvature (Ham et al. 2011). Similarly, van Dijk et al. reported a mean change in spherical equivalent of +0.33D at 6 months after DMEK. Refractive stability was shown at 3 months post-operatively with no significant change in spherical equivalent between 3 and 6 months follow-up (2013). Because of this hyperopic shift, surgeons performing cataract removal prior to DMEK may choose to select a lens that leaves the patient myopic by approximately -0.50D. DMEK is a surgical procedure with excellent visual outcomes, and advances are being made to improve graft adherence and simplify donor preparation. Technique standardization and confirmation of its success via further clinical study will make the procedure more accessible to surgeons and aid in its widespread adoption. Dapena I, Ham L, Droutsas K, van Dijk K, Moutsouris K, Melles GR. Learning curve in Descemet’s membrane endothelial keratoplasty: first series of 135 consecutive cases. Ophthalmology. 2011 Nov;118(11):2147-54. Dapena I, Moutsouris K, Droutsas K, Ham L, van Dijk K, Melles GR. Standardized “no-touch” technique for Descemet membrane endothelial keratoplasty. Arch Ophthalmol. 2011 Jan;129(1):88-94. Dirisamer M, Ham L, Dapena I, Moutsouris K, Droutsas K, van Dijk K, Frank LE, Oellerich S, Melles GR. Efficacy of Descemet membrance endothelial keratoplasty; clinical outcome of 200 consecutive cases after a learning curve of 25 cases. Arch Ophthalmol. 2011 Nov;129(11):1435-43. Doan A, Lee AG. Fuchs endothelial dystrophy: 35-year-old female with blurry vision OU lasting hours in the morning. EyeRounds.org. February 21, 2005; Available from: http://www.EyeRounds.org/cases/case5.htm. Feng MT, Price MO, Price FW. Update on Descemet membrane endothelial keratoplasty (DMEK). Int Ophthalmol Clin 2013 Spring;53(2):31-45. Graff GM, Goins KM. Deep lamellar endothelial keratoplasty (DLEK) for Fuchs: 72-year-old female with Fuchs. EyeRounds.org. February 25, 2005; Available from: http://www.EyeRounds.org/cases/33-DLEK-deeplamellarendothelialkeratoplasty.htm. Guerra FP, Anshu A, Price MO, Price FW. Endothelial keratoplasty: fellow eyes comparison of Descemet stripping automated endothelial keratoplasty and Descemet membrane endothelial keratoplasty. Cornea. 2011 Dec;30(12):1382-6. Guerra FP, Anshu A, Price MO, Price FW. Descemet’s membrane endothelial keratoplasty: prospective study of 1-year visual outcomes, graft survival, and endothelial cell loss. Ophthalmology. 2011 Dec;118(12):2368-73. Ham L, Dapena I, van Luijk C, van der Wees J, Melles GR. Descemet membrane endothelial keratoplasty (DMEK) for Fuchs endothelial dystrophy: review of the first 50 consecutive cases. Eye (Lond). 2009 Oct;23(10):1990-8. Ham L, van Luijk C, Dapena I, Wong TH, Birbal R, van der Wees J, Melles GR. Endothelial cell density after Descemet membrane endothelial keratoplasty: 1- to 2-year follow-up. Am J Ophthalmol. 2009 Oct;148(4):521-7. Ham L, Dapena I, Moutsouris K, Balachandran C, Frank LE, van Dijk K, Melles GR. Refractive change and stability after Descemet membrane endothelial keratoplasty. Effect of corneal dehydration-induced hyperopic shift on intraocular lens power calculation. J Cataract Refract Surg. 2011 Aug;37(8):1455-64. Laaser K, Bachmann BO, Horn FK, Cursiefen C, Kruse FE. Descemet membrane endothelial keratoplasty combined with phacoemulsification and intraocular lens implantation: advanced triple procedure. Am J Ophthalmol 2012;154:47-55. Liarokos VS, Dapena I, Ham L, van Dijk K, Melles GR. Intraocular graft unfolding techniques in Descemet membrane endothelial keratoplasty. JAMA Ophthalmol. 2013 Jan;131(1):29-35. McCauley MB, Price FW Jr, Price MO. 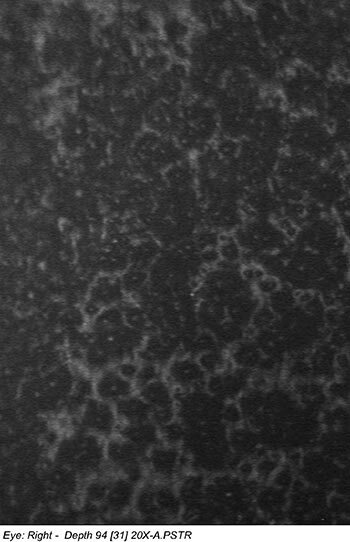 Descemet membrane automated endothelial keratoplasty: hybrid technique combining DSAEK stability with DMEK visual results. J Cataract Refract Surg. 2009 Oct;35(10):1659-64. Melles GR, Eggink FA, Lander F, Pels E, Rietveld FJ, Beekhuis WH, Binder PS. A surgical technique for posterior lamellar keratoplasty. Cornea. 1998 Nov;17(6):618-26. Melles GR, Ong TS, Ververs B, van der Wees J. Descemet membrane endothelial keratoplasty (DMEK). Cornea. 2006 Sep; 25(8):987-90. Pramanik S, Goins KM, Sutphin JE. Corneal endothelial transplantation: Descemet’s stripping endothelial keratoplasty (DSEK). EyeRounds.org. February 23, 2006; Available from: http://www.EyeRounds.org/cases/54-Descemets-Stripping-Endothelial-Keratoplasty-DSEK.htm. Price MO, Giebel AW, Fairchild KM, Price FW. Descemet membrane endothelial keratoplasty: prospective multicenter study of visual and refractive outcomes and endothelial survival. Ophthalmology. 2009 Dec;116(12):2361-8. Price MO, Price FW Jr. Descemet membrane endothelial keratoplasty. Int Ophthalmol Clin. 2010 Summer;50(3):137-47. Studeny P, Farkas A, Vokrojova M, Liscova P, Jirsova K. Descemet membrane endothelial keratoplasty with a stromal rim (DMEK-S). Br J Ophthalmol. 2010 Jul;94(7):909-14. Terry MA, Ousley, PJ. Deep lamellar endothelial keratoplasty in the first United States patients: early clinical results. Cornea. 2001;20:239-243. Terry MA. Endothelial keratoplasty: why aren’t we all doing Descemet membrane endothelial keratoplasty? Cornea. 2012 May;31(5):469-471. Tourtas T, Laaser K, Bachmann BO, Cursiefen C, Kruse FE. Descemet membrane endothelial keratoplasty versus Descemet stripping automated endothelial keratoplasty. Am J Ophthalmol. 2012 Jun;153(6):1082-90.
van Dijk K, Ham L, Tse WH, Liarakos VS, Quilendrino R, Yeh RY, Melles GR. Near complete visual recovery and refractive stability in modern corneal transplantation: Descemet membrane endothelial keratoplasty (DMEK). Cont Lens Anterior Eye. 2013 Feb:36(1):13-21. Yoeruek E, Bayyoud T, Hofmann J, Bartz-Schmidt KU. Novel maneuver facilitating Descemet membrane unfolding in the anterior chamber. Cornea 2013 Mar;32(3):370-3. 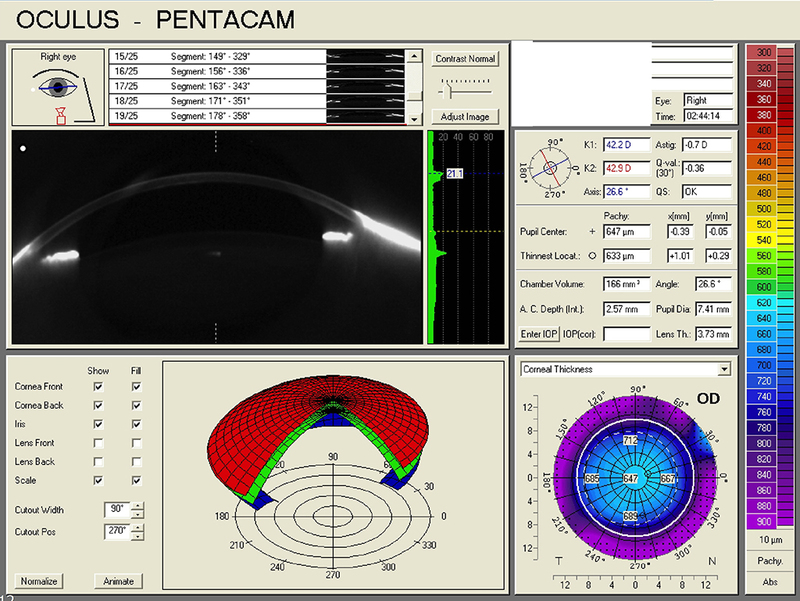 Deep Lamellar Endothelial Keratoplasty (DLEK) for Fuchs. Corneal Endothelial Transplantation: Descemet's Stripping Endothelial Keratoplasty (DSEK).